Here at Northwoods Zip Line Adventure Tours we are passionate about getting out in the fresh air and experiencing the great outdoors. We proudly offer the biggest and best ziplining adventure course in Wisconsin and the Midwest as well as many other exciting activities. 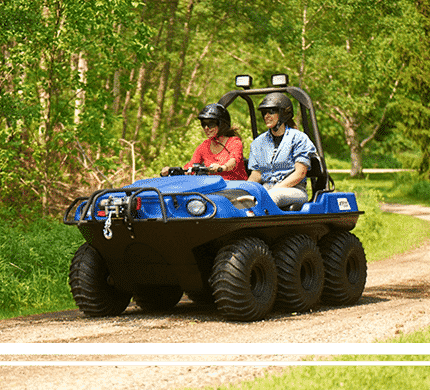 We offer something for everyone, whether you want to drive an Argo ATV, zip 1,000 ft over a wilderness lake, join a guided kayak tour on the stunning Tomahawk River or take on exciting aerial challenges up in the treetops. 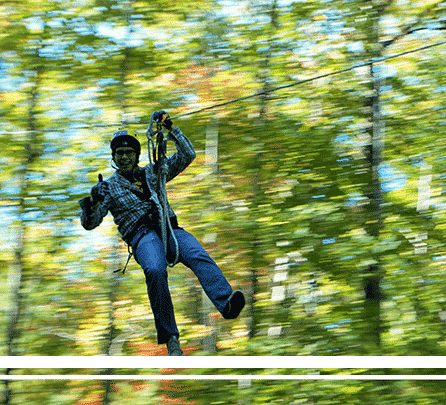 Northwoods Zip Line Adventure Tours is your one-stop-shop for eco-adventure tourism. We’re excited to offer you unforgettable, fun-packed wilderness adventures year round. Whichever tour you choose, we guarantee that you’ll have an memorable trip with us up here in the Northwoods. So what are you waiting for? Check out our tours below. Join us in the treetops as you take on nine exciting zips and traverse five fun adventure bridges. You’ll be with our expert guides as you complete the biggest and best zip line course in the Midwest! This tour was specifically designed for thrill-seekers looking for the ultimate challenge. 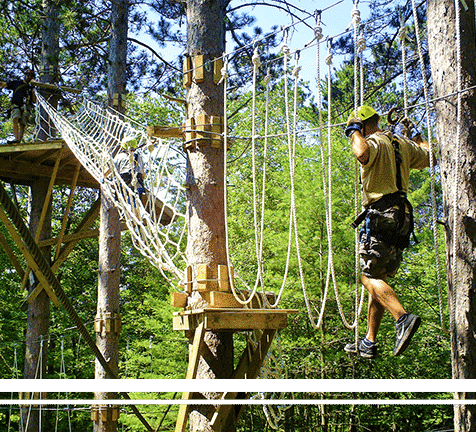 Climb, zip, and swing up amongst the pine trees as you take on the aerial elements, zips and obstacles! Get behind the wheel and experience a brand-new, one-of-a-kind tour! On this family friendly experience, you’ll zoom around a 900 acre Whitetail Deer Game Farm. 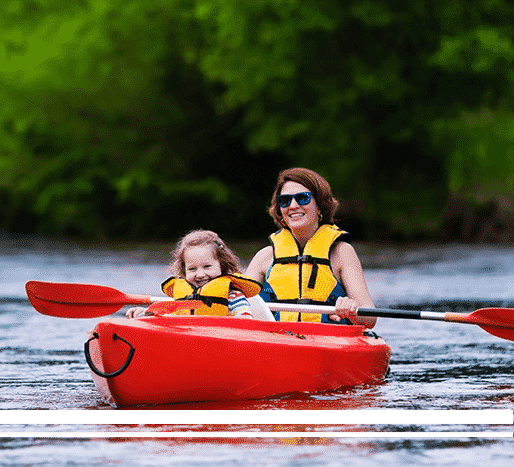 Join our local guides on our Tomahawk River Guided Kayak Tour. Immerse yourself in the Northwoods wilderness while learning about local nature and wildlife. Custom made for kids as young as three, this tour is all about fun! Kids will experience the thrill of zip lining, crossing adventure bridges and more on the Kids Zip Line Tour! Since opening in 2014, we’ve seen our popularity, reputation and customer base grow. This has given us the ability to build more and more activities and adventures for you and your family and we don’t plan on stopping! We’re a small, local business and we love what we do. Our prices are high and we’re proud of this, it reflects the high-quality experiences and service you’re sure to have with us here at Northwoods Adventure Zip Line. We take safety extremely seriously and we’re proud of our 100% safety record. Our tours are inspected each morning before any visitors arrive. We are inspected annually and certified by a third party PVM and professional engineer, ensuring that we meet and exceed ACCT and structural engineering standards. All our guides go through rigorous training so you are in good hands when you come on any of our tours! Our facility is perfect for adventure seekers of all ages! Located in the beautiful Northwoods forest, we have everything from zip lining, aerial trekking, Argo ATV Tours, kayaking to team building. We pride ourselves in offering activities for people of all ages and abilities and have guided people well into their 90’s around our courses. For us, it’s not your age that matters but that you come with a positive attitude and an adventurous spirit! 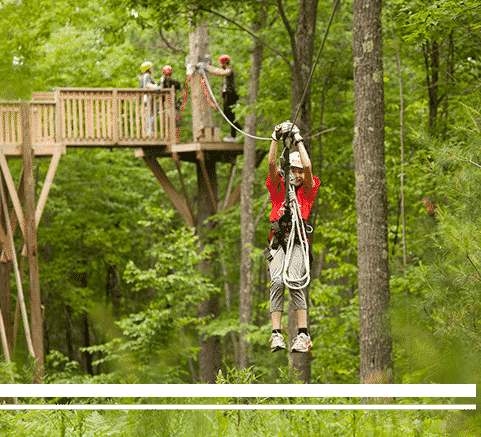 Even though zip line is in our name, we offer a variety of activities. 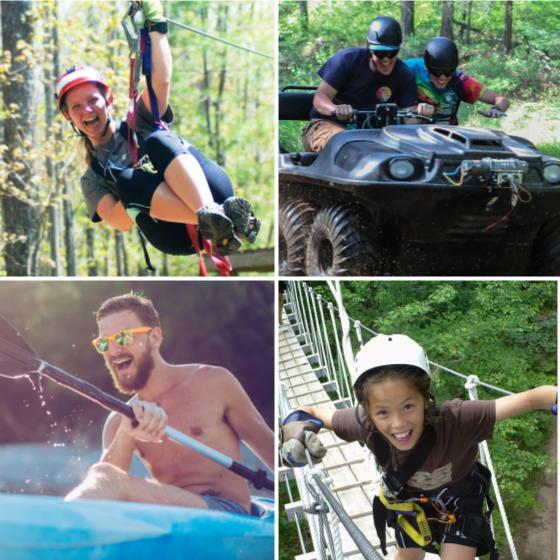 Whether you want to zip line, aerial trek, kayak, argo atv, mountain bike, paddle board, hike, or take part in wilderness group dynamics, we have it all! All of our tours include professional, trained guides to show you the ropes as well as to teach you a bit about the Northwoods forest and surroundings. Our tours are perfect for small groups, families or company outings! Northwoods Zip Line Adventure Tours offers unique corporate outings and team building experiences which are expertly customized to your group. We pride ourselves on being a leader in wilderness based adventures and offer a new and exciting alternative to traditional team building. We run our programs in the Northwoods Forest and build them around wilderness activities, survival skills and even race style challenges. Sign up to our newsletter to receive all our latest news, coupons, chances to win free tours and more. We invite anyone who has taken part in our tours to give paddle boarding a go on our pristine lake, for no additional cost! Just you and the smooth, open water. Paddle boards are available on a first come first serve basis. We built a 2.5 mile mountain biking trail which is free to use and open all year round. We don’t supply or rent bikes so please bring your own or ask for a local rental recommendation.